You are currently browsing the Suburban Homesteading – Frugal Living blog archives for March, 2014. In my neck of the woods, February and March are prime garden readiness months. Fruit trees are pruned, berries are trimmed of dead canes and tied to trellises or fencing, raised beds are restocked with compost or built brand new. But, the most fun of this time of year is starting seeds. We mark the day on our calendars and when it arrives the task begins like the start of an Olympic race. There’s truly nothing better than plunging your hands deep into freshly dug soil, warmed by the spring sun and planting homegrown seedlings started way back in winter, when spring was just a hope and a dream. And, the money you save over buying already started veggies and the vibrant taste of homegrown food ain’t bad either. This is also the time when garden centers and hardware stores stock a plethora of seed starting paraphernalia: peat pots, soil pellets, plastic pots, covered mini-greenhouses, you name it, if it can start a seed, some store in your area will carry it. About a decade ago, a librarian from New York State had the great idea of offering seeds right along side the racks of fiction, novels and movie rentals. The project has now blossomed into the Hudson Valley Seed Library. 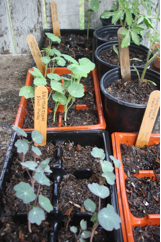 Members borrow seeds just like books and replace them after the harvest. Since its inception the trend has taken root. Not from New York? Not to worry. 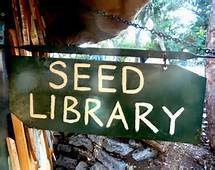 The Richmond, California Public Library has compiled a state-by-state list of all 150 seed lending libraries. Check out one near you. The best part though…there are no fines for overdue seeds!